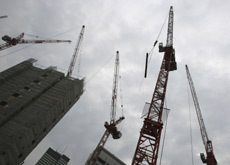 UK construction companies are still chasing about 200 million pounds ($330m) worth of unpaid bills in the UAE, an officer at a UK business group has said. “There’s still quite a lot outstanding and possibly well in excess of 50 percent outstanding,” Nelson Ogunshakin, chief executive of UK trade body the Association for Consultancy and Engineering, or ACE, which represents about 800 construction firms, told newswire Zawya Dow Jones. In May ACE said British construction companies were owed 400 million pounds by UAE-based real estate developers, mostly in Dubai. He told the newswire that while progress has been made in recouping some of the money, settlements were still “not coming in fast enough”. Earlier this month, it was reported that Japanese construction companies were facing “serious debt problems” amid issues with being paid for work done in Dubai. Seiichi Otsuka, the Japanese consul general in Dubai, claimed firms are still owed billions of dollars on projects that include the Dubai Metro and Palm Island. The non-payments have been linked to the real estate and construction downturn in the UAE which has seen developers delaying payments to contractors. Some 566 projects have either been shelved or postponed in the UAE, mostly in Dubai, Dubai-based market research firm Proleads said in September. Next articleDubai metro video – Sheikh Zayed Road.